The project for archaeological research in the Dragoyna region began in 2004 under the Archaeological Museum in Plovdiv and Sofia University. The project is headed by Dr. Kostadin Kisiov and, after 2006, by Elena Bozhinova. Excavations were carried out on the summit of Dragoyna in 2004, 2005 and 2006, and a new campaign is planned for the period of August 1 – September 15, 2007. Field surveys were conducted in the region in May 2005. Excavation of some of the tumuli is also planned for the next years. Dragoyna is located between the modern villages of Dragoynovo and Bukovo in the municipality of Parvomai, district of Plovdiv. The hills of Dragoyna are situated in a transitional region between the high mountains of the Central Rhodopes and the broad valley of the Maritza (Hebros) river. These regions were occupied by the Thracian tribes of the Bessae and the Odrisae respectively. The archaeological cultural material points to significant differences between these two communities. Evidence from the Dragoyna site proves that the site held an intermediate position, for the artifacts have parallels in both regions. The summit of Dragoyna consists of two peaks and is the highest point in a region of low mountains (813.6 m). It disposes over an excellent strategic location, as the view from the site extends over a distance of 50 km in radius. The site presents a large complex that could be interpreted as a settlement, which ranked at least as a regional center. The archaeological material and remains of structures were found over the entire area of the mountain ridge and on some of the terraces of the summit. The highest part of the mountain top (Velka Dragoyna) is occupied by a fortification area of nearly 2000 sq.m. which could be identified as the acropolis of the settlement. It has been suggested that the lower peak, Malka Dragoyna, was a place for cultic activities, for it is not suitable for living: the entire area is covered by huge rocks. The saddle between the two peaks is large and flat and was probably built up with houses or similar structures. Parts of three roads were found that lead from the peak to the north, west and south. Most preserved today is the road to the south, which is the shortest and easiest way to the site. On some of the flat terraces on the southern slope near the road sherds of cooking pots and pithoi were found, which indicate that further habitation areas were located there. All of the excavations carried out until now were concentrated on the fortified part on the highest peak at Dragoyna. There an area of about 450 sq.m. was uncovered. The site was inhabited, probably continuously, from the Late Bronze Age until the Early Hellenistic period. This area was first occupied at the beginning of the Late Bronze Age (17th–16th century BC), as only few sherds belong to vessels with forms and decorations that are typical of the late phases of the Early Bronze Age cultures in Thrace. A large number of typical sherds of the Late Bronze Age (LBA) were recovered during the excavations, most of which were found in re-deposited/secondary contexts. 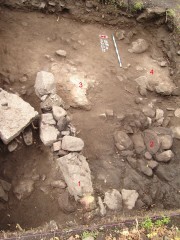 The only structure that could be assigned to this period is the stone foundation of a building measuring 3 x 5 m in size. It is located on the highest part of the mountain top, among the high rocky cliffs that were used practically as walls. The walls are founded in a layer that contains homogeneous LBA material: local pottery and two sherds of wheel-made vessels, one of which is grey in color and probably originates from Anatolia. The local pottery is decorated with various geometric motifs, incised in the Furchenstich technique. The forms of the vessels are typical of the uniform LBA North Balkan complex, but closer to the regional peculiarities of the pottery of the Western Rhodopes. Other artifacts dated to this period are an ornate model of a wheel and likely some of the spindle whorls as well. About ten sherds found in different parts of the excavated area were identified as deriving from wheel-made vessels: two goblets and one rounded alabastron of Late Helladic III A1 style, probably of North Aegean origin. The center of the settlement area during the LBA was situated on the highest part of the mountain top. Although the function of the site is still not clear, judging from these early imports it was important at least as a regional center. The mountain top continued to be inhabited during the Early Iron Age (EIA), 11th–6th century BC. The number of artifacts found during the excavations and dated to this period is limited, and no further structures were revealed. The settled area probably shifted in location somewhat during this period. Similar to the LBA, EIA pottery from Dragoyna has closer parallels with the pottery in the Western Rhodopes. Channeled decoration prevails, whereas stamped designs are few, consisting mainly of circles. One sherd of a painted vessel of the Bird bowl style (7th century BC) indicates that the site was an important center during the last phases of this period. During the Late Iron Age (LIA), that is the period after the 5th century BC, the settlement area was enlarged. The highest part of the mountain was enclosed by a stone wall. Probably the saddle between the two peaks and the terraces on the southern slope were settled for first time during this period. The date of construction of the fortification wall is still not clear, however two construction phases have been suggested. The wall was first built of large sandstone blocks obtained from a quarry in a nearby region and well finished. This construction is partly preserved only in the northern section of the wall, where one of the entrances was most likely located. Later the wall was rebuilt, and these blocks were reused together with large un-worked blocks of the local volcanic rock. At that time the wall had a thickness of 2.80 m. Larger blocks were used to build its outer shell, and the space in between was filled with smaller stones and earth. Around the middle of the 3rd century BC the wall was destroyed by an unknown agent. Perhaps it was caused by an earthquake, which is indicated in the destruction of tombs built in the region of Hissar and the Getae’s capital of Helis. The enclosed area was extensively built, as parts of five buildings dated to the 5th–3rd century BC have revealed until now. The walls of all of the buildings have stone foundations, and the data supplied by from the excavations enable the reconstruction of wooden super-structure. Tiles were not used for roofing. One of the buildings was used over a longer period of time; at least three phases of reconstruction have been documented thus far. Its function as a house is confirmed by the installation of hearths (one in each of the phases) and of an oven during its latest phase. Only part of the house has been excavated until now, and it is more than 3 x 10 m in size. The building erected in the LBA was reconstructed and continued to be used during the Hellenistic period. One or more of the buildings made use of the fortification for one of their walls. Field surveys in the region led to the localization of two other sites that are contemporary with Dragoyna and have a similar location. These sites are located upon the mountain tops of Sivridjika and St. Ilia in the vicinity of the village Iskra. The three sites are situated at a distance of c. 5 km from each other within clear view of one another. The similarities exhibited by these settlements as well as the lack of other documented sites dating to the Bronze and Iron Age in the region prove that mountain tops were the preferred place for habitation during that period. A single find, a vase-stand richly decorated with Furchenstich, is known from the plain area, that is, the banks of the Mechka river. By contrast, many rock-hewn niches and a sufficient number of sites with Bronze and Iron Age pottery were documented in the mountainous region to the southeast. A necropolis with c. 15 tumuli was documented that is located on both banks of the Kaialiika river, to the north of the Dragoyna mountain site; it is most likely the necropolis of this settlement. Richly furnished graves built of stone blocks and dated to the Greek Classical period were found in two of the tumuli, which had been destroyed in the last centuries. 5 Another burial monument was documented in the immediate vicinity of the site, a megalithic monument or dolmen. Although neither pottery nor other artifacts were found, the dolmen could be assigned to the early stages of the Iron Age, the period during which grave structures such as this were built and used in Thrace. The early imports suggest that a travel route once ran near Dragoyna, which connected the northwest Aegean via the Western Rhodopes with the Hebros valley during the Late Bronze Age. The region maintained its importance as a Thracian political and trade center until the middle of the 3rd century BC. Although the name of the site is still unknown, the discovery in one of the aforementioned tumuli of a ring bearing a sign from a Thracian language 7 as well as a stilus found at the Dragoyna site raises hopes that future research will ultimately reveal it. 1 И. Велков, Един тракийски селищен център. – Известия на Археологическия Институт, ХІХ, 1955, 85-93. 2 K. Leshtakov, Some Suggestions Regarding the Formation of the “Thracian Religion” (in the Light of New Archaeological Evidence from South Bulgaria). – In: L. Nikolova (ed. ), Material Evidence and Cultural Patterns in Prehistory. Reports of Prehistoric Research Projects 5, 2001, 19-51. 3 M. Domaradzki, Sanxuraires thraces du IIe – Ier millenaire av.n. 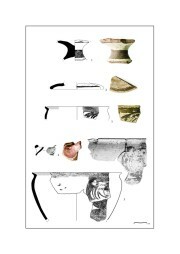 – Acta Archaeologica Carpathica, XXV, 1986, 89-104. 4 The imports from the Hellenistic period are being studied by Chavdar Tzochev, Sofia University. 5 Б. Филов. Златенъ пръстен съ тракийски надписъ. – Известия на Българското Археологическо Дружесво, ІІІ, 1912-1013, 200-222. 6 Х. Попов, С. Илиев, Селище от Късната Бронзова и Ранната Желязна Епоха в м. Куш кая, с. Вълче поле, община Любимец. – Археологически открития и разкопки през 2006 г., 2007, 199-202. 7 Б. Филов оpp. cit. Bozhinova, E. "The Bronze and Iron Age Site of Dragoyna." 14 Jun. 2007. In: Horejs, B. - Pavúk, P. (eds. ): Aegean and Balkan Prehistory. http://www.aegeobalkanprehistory.net/index.php?p=article&id_art=1 (23 Apr. 2019).